Each Powerbrace lockrod assembly kit includes all the components needed to build and mount one lockrod (tubing sold separately). Combine your Powerbrace lockrod assembly kit with Powerbrace high yield 55,000 psi pre-galvanized heavy-duty alloy tubing and your lockrod repair solution is complete. All the components to your custom kit are included in one all-inclusive package. Factory-assembled lockrods built to your exact length specifications with both cams and riveted handle assembly factory welded. Just add mounting hardware. Manufactured lockrod with bottom cam and riveted handle assembly factorywelded in place. Simply cut to length, weld on top cam and mount using TEL hardware kit. Save valuable time and labor with this cost effective option. 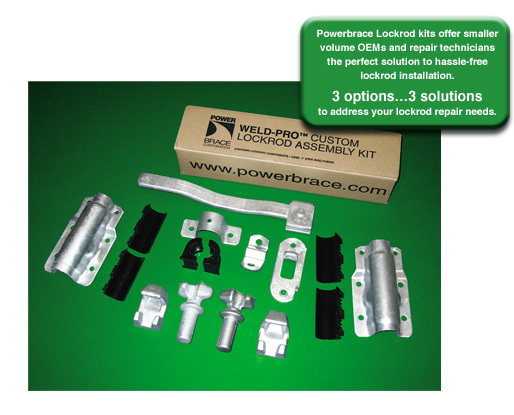 Each Powerbrace lockrod assembly kit includes all components needed to build and mount one lockrod (tubing sold separately). Combine your Powerbrace lockrod assembly kit with Powerbrace high yield 55,000 psi pre-galvanized heavy-duty alloy tubing and your lockrod repair solution is complete.